To follow up on the book reviews in the previous post, the nest in the photo here was made this spring by a Black-capped Chickadee. The bird used one of the round PVC nest boxes in our yard. 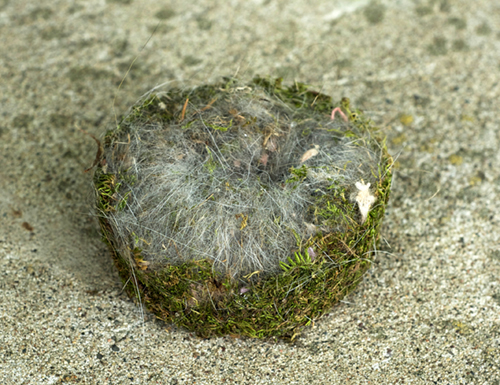 The nest is four-inches in diameter, one and a half inches in depth. It’s composed mostly of moss, with plant down, various fibers, feathers, and horse hair. Consider the size of a chickadee bill: The pair of birds that built this nest made hundreds of trips to gather the building material. Moss, we’ve got it in our yard. As far as I know, the birds had to fly at least a mile one-way to find the horse hair. So far this season I’ve found or been shown nests built by Black-capped Chickadee, House Wrens, Tree and Barn swallows, Wood Duck, Canada Goose, Downy Woodpecker, cardinal, Red-winged Blackbird, Great Blue Heron, and kingfisher. I’m looking for more. Given the season and thick foliage, however, the best time for searching is ahead of us, in the fall, when the leaves have fallen.